What is a marginal tax rate, anyway? Many Americans believe those who earn enough to fall in the top individual income tax bracket pay 37 percent of their income in federal income taxes. This isn’t how it works. An individual who earns enough to reach that top bracket is taxed at each bracket along the way before the 37 percent bracket. The United States has seen marginal individual income tax rates as high as 94 percent, which happened in 1944 and 1945. This doesn’t include the executive order that President Franklin D. Roosevelt issued mandating a marginal individual income tax rate of 100 percent. In an April 1942 message to Congress, President Roosevelt said, “[I]n time of this grave national danger, when all excess income should go to win the war, no American citizen ought to have a net income, after he has paid his taxes, of more than $25,000 [$375,950 in 2017 dollars] a year.” Congress didn’t act on the proposal. In October 1942, President Roosevelt issued Executive Order 9250, which capped after-tax income at $25,000. At the time, the highest marginal individual tax rate was 88 percent. The lowest was 23 percent. The 94 percent tax rate in 1944 and 1945, the legislation for which repealed the executive order, was the response from Congress to President Roosevelt. Between 1950 and 1963, the highest marginal individual income tax rate fluctuated between 91 percent and 92 percent. In his final State of the Union address in January 1963, President John F. Kennedy urged Congress to reform the tax code and lower tax rates. “For it is increasingly clear -- to those in Government, business, and labor who are responsible for our economy's success -- that our obsolete tax system exerts too heavy a drag on private purchasing power, profits, and employment,” said President Kennedy. The tax reforms pushed by President Kennedy wouldn’t take place in his lifetime. In 1964, Congress passed the Revenue Act, which lowered the top marginal individual income tax rate to 77 percent. After this point, the highest marginal tax rate varied, eventually falling to 69.125 percent in 1981. The Economic Recovery Tax Act of 1981 lowered the top marginal individual income tax rate to 50 percent. The historic Tax Reform Act of 1986 lowered the top marginal individual income tax rate to 38.5 percent and overhauled the tax system. Since the 1986 tax reform bill, the highest marginal individual income tax rate hasn’t eclipsed 39.6 percent. Thanks to the Tax Cuts and Jobs Act of 2017, the highest marginal individual income tax rate is 37 percent. The far-left will say the level of taxation in the 1950s didn’t hurt the economy. They’ll claim this debunks the free-market view that confiscatory taxation has a severely negative impact on Americans. Of course, their view misses some important things. First, few people actually paid a 91 percent or 92 percent tax rate. Scott Greenberg of the Tax Foundation notes this is likely due to “significant tax avoidance and lower reported income.” There were also deductions and exemptions that allowed tax filers a way out of the highest marginal tax rate. Second, the economy of the 1950s wasn’t the boom period the far-left would have us believe. Americans have an odd hindsight memory of the 1950s. Despite social tension due to the mistreatment of African-Americans, this period in American history has been romanticized. This nostalgia is extended to the economy of the time. 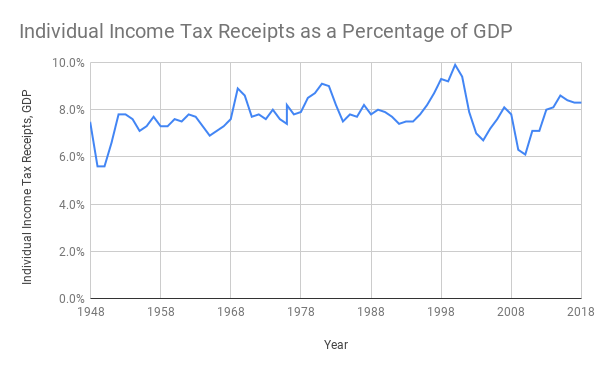 Finally, individual income tax receipts as a percentage of the economy are actually higher today than it was during any point in the 1950s. Individual income tax receipts as a percent of gross domestic product (GDP) reached a high point in the 1950s at 7.8 percent. For 2018, individual income tax receipts are a projected 8.3 percent. Rep. Ocasio-Cortez’s vision for the tax code will almost certainly reduce incentives to work, and lead to decreased productivity. This means less investment in the economy, less saving, and fewer opportunities for Americans. Undoubtedly, the far-left -- these so-called “democratic socialists” who believe “every billionaire is a policy failure” -- would have us believe these confiscatory levels of taxation will be used to create a plethora of new government programs. Such experiments have been tried in Europe, and are still being attempted. These countries experience relatively weak economic growth despite government spending, in many instances representing more than 45 percent of GDP. If the far-left experiment worked, these countries with high taxes and heavy government spending would be growing, but they’re not. We should reject the notion that wealthier Americans aren’t paying their “fair share,” as the far-left would have us believe. 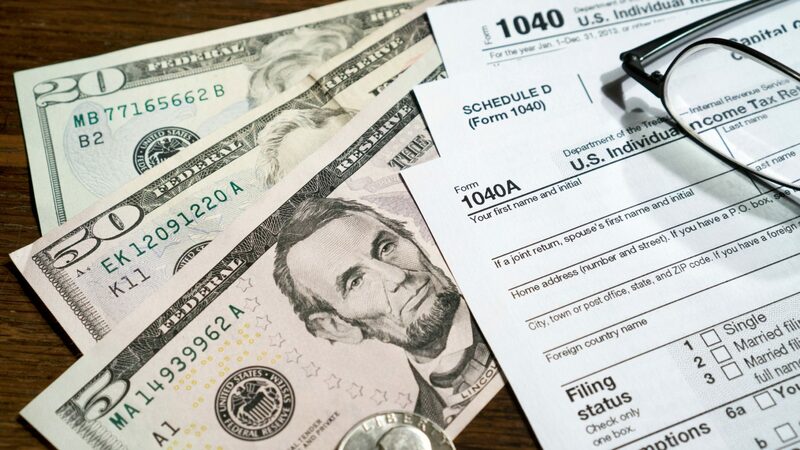 In tax year 2016, the top 3 percent of tax filers earned 29 percent of adjusted gross income (AGI) but paid 51 percent of all federal individual income taxes. The bottom 50 percent earned 11.6 percent of AGI and paid 3 percent of income taxes. There is nothing fair about that picture. The good news is, there’s next-to-no chance of a return to 91 percent or 92 percent marginal individual income tax rates, or even the 70 percent that Rep. Ocasio-Cortez wants in the immediate future. But the fact that she floated those numbers on national television, and no Democrat in Congress blinked an eye, should concern us all.